Today was a profound moment for me. One of those "jolt you out of complacency" types of days that can redirect your whole life. Thanks of course, to a special horse, who has a deeply important message, not just for me, but for YOU, and the person next to you, and everyone, everywhere. 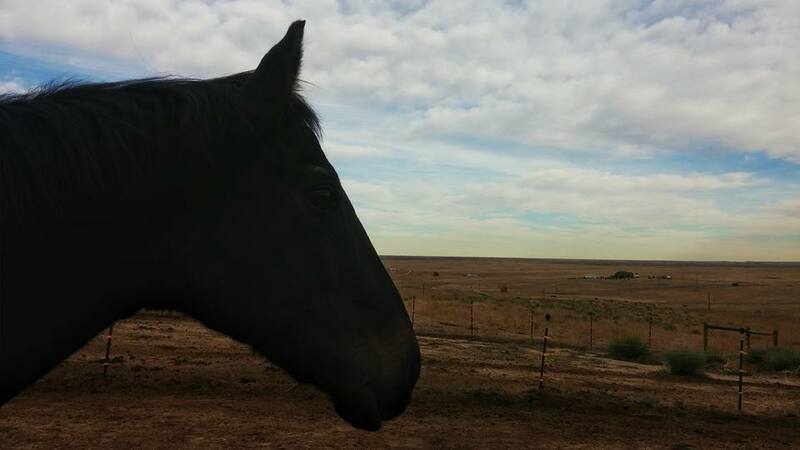 A wonderful horse Carson wants you to know why you are here, so that you can live your purpose, and help other people, and other horses, live theirs as well. And by doing so, we can all UPLIFT the whole-wide world! Discover this empowering message through the video or blog post below. In the video you will see that Carson is a bit cramped in the small space we were using to try to avoid wind noise (and he wants to be snacking with the other horses too). But I bet you'll still find his behavioral affirmations of my verbal message intriguing! This isn't a short post/video, so grab a cup of tea and settle in for a splendid reminder of how YOU are meant to make a difference in the world TODAY! How do Carson's messages impact you? Please share in the comments below. 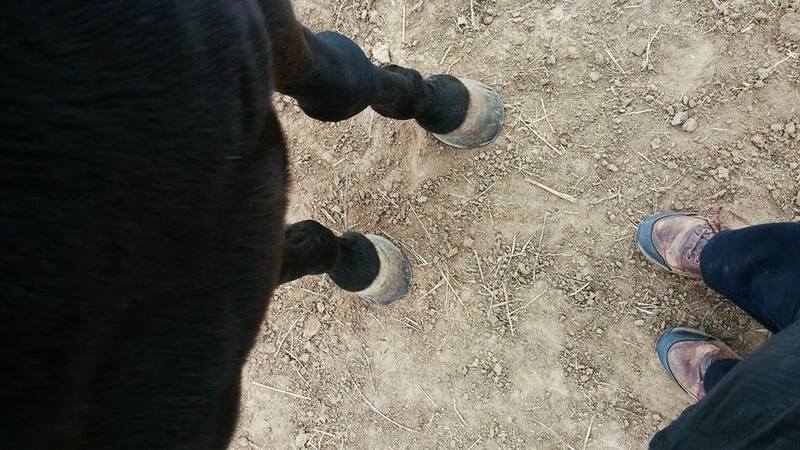 Access to this profound insight started unsuspectingly, when I went down to feed the horses lunch. I almost walked right past Carson in his paddock, as I most often do, preferring to think of him as "my husband's horse." But he walked purposely toward me and for some silent reason, I bent through the fence and entered his pen to say hello, which frankly, I rarely do. But thankfully, today there was a magnet pulling me towards a Message and it's Gift. 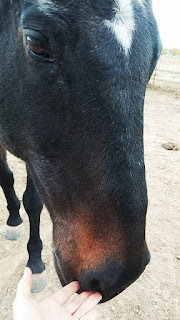 Carson, is an older gelding that we inadvertently "rescued" last year when the lady we had him on a week's trial from refused to take him back and kept our deposit. It was somewhat of an ugly situation, when this horse who was advertised as a "fancy, totally sound schoolmaster," showed up to our place 150 pounds underweight, with not a sound leg on him. After over $1500 in vet bills and attempts to help this horse be sound, we had to admit defeat and realize that the best we could do was make him more comfortable, which we did, to the best of our ability. So at 21 years of age, I kept having the nagging doubt that we should find Carson a new home, maybe a full retirement home, because he really couldn't do what we got him to do in the first place (be my husband's baby level eventing schoolmaster), and keeping him comfortable was an expensive proposition. So I walked into Carson's pen that day overwhelmed with doubts. And yet, he was finally blossoming here. There was no doubt that Carson was a stoic horse who spent his life in show barns, being expected to toe the line. And toe the line he did, doing as he was expected, quietly without much complaint, as so many horses do. But frankly, by the time he came here, he had tuned out. Shut down. Not expecting much from humans except being told what to do. He was standoff-ish and remote. Though he did go through the motions...keeping Greg safe. These weren't things he was accustomed to considering, so he appeared to shut them out. Apparently though, another process was going on underneath that steely exterior. Over the 7 months of us offering him our gentle & thoughtful care, he began to brighten. And over the last few weeks, I had noticed a clear change. He was more open to interaction. He showed more interest in us. He was now seeking out attention and appearing to actually enjoy, instead of just tolerate, affection. He had rounded a corner. He had become emotionally available. But I was just about to find that he has SO much more to offer. And so I stood with Carson for a quiet moment that day in his paddock. And an unexpected thing started to happen. He started to offer his thoughts, while enveloping me in healing energy, for the very first time ever!!! Sensing my ongoing doubts about his future, he started the first conscious conversation that we'd ever had with, "You know I'd really like to stay here." "I've learned so much more here in a short time than I ever did in all of those fancy barns," he continued, as he started to do what I had NEVER seen him ever do- start clearing my chakras. 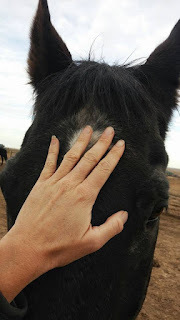 He moved around me naturally, like any healing horse, and begun using his mouth and head to move stuck energy off of me, as if showing me all he had learned. He repeatedly hit his head lightly on my stomach and dragged it up my body, working on shifting my lower chakras, causing me to take big, cleansing breathes. "I still have more I want to learn here, and more to offer, too," he continued, as he moved forward and back over my body, repeatedly placing his nostrils over my hands to move energy. "And you opened my heart!," he shared, as he moved to place his heart directly in front of me, his neck hovering over my head, inviting me to move in for a heart-hug. "You're a Heart-Opener, you know that right?," he spoke, as I burst into tears from the heart energy that flowed now, from him to me. "It's just part of your Presence. It's part of what happens for people when they are around you," he explained. "And you all underestimate the difference that this makes!," he explained, as he showed me the Ripple Effect that happens when just one Being, Human or Horse, opens their heart, it expands outward to everyone THEY then meet. "And so imagine, even if you help to open just ONE Being's heart, all the good that does for the world!" "But now imagine, opening 10 people's hearts, or a 100, or even a 1000!!! You have NO IDEA the amazing effect that has on the transformation of the world!," he almost shouted in my ear, as he stuck my fingers further up his nose. 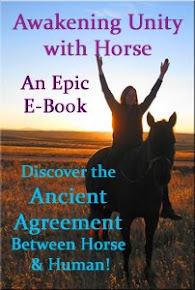 I was crying in earnest now, feeling the impact of the Truth of his words and the beautiful vision it inspired, knowing that each and every one of US, all of the facilitators with horses, are Heart-Openers, as are our healing herds. But Carson wasn't even done yet. He still had more wisdom to share! As he continued to nip & nudge energy off of my head, my hands, and my back, he spoke, "Not only do you humans underestimate the power of opening hearts, you forget a simple truth..."
He moved so that we were standing next to each other, facing the horizon, looking forward, "You forget the basic principle, that whenever two or more join hearts, there is a magnification of what is possible." Then he showed me a magnificent & powerful picture, "When humans create these spaces, such as a ranch or healing center, where ALL of the beings have open hearts and work together, their hearts begin to beat in unison, and the coherence of their heart energy gets sent out into the world." Carson reflected, "You all may never be directly aware of the impact this emission that You and your Herds create, but it is REAL and it MATTERS." 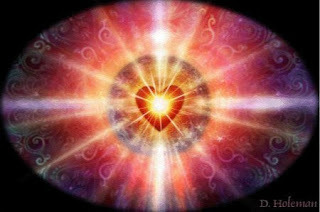 This energetic offering has an immeasurably beautiful effect all over the planet, especially as more and more groups of beings are offering a similar loving vibration to the Collective. Carson solemnly asked if he could be activated as an Official Heart-Opener of the Happily Ever After Herd. He wanted to consciously be a part of the herd's collective emission, from this point forward. How could I refuse such a request! Although I didn't know that it was technically needed, the recognition seemed important to him, and so I laid hands to anoint his Holy Heart as a welcome gift to the Loving Vibration that comes from this piece of land and the beings upon it, out to the cosmos. Wow! 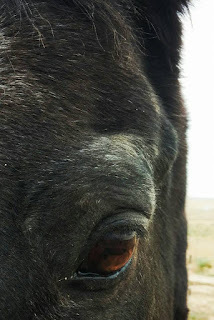 I was awed by this wonderfully wise horse who had emerged from a hardened shell. 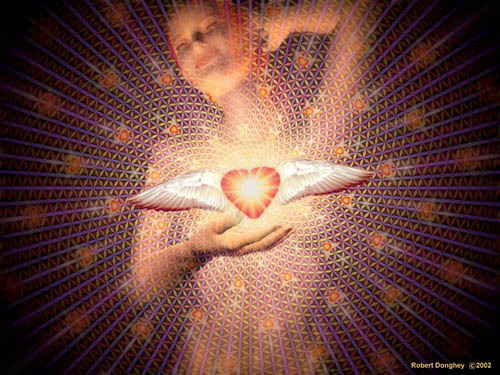 Later that day, as a result of his healing gifts I was able to access a feeling of freedom in my body that I had not felt in quite some time. It was delicious! Over the next few days I noticed that all of my "burdens" no longer felt heavy. It was as if there was a soothing blanket over all of my world and suddenly there weren't "problems" to be solved. There was just peace. It was quite a juicy shift in perspective! ~ I had never consciously intended to heal Carson's heart. I never laid healing hands on him. We never did healing processes together. He wanted me, and all of us, to understand that healing can happen by simply being in the Presence of an Open and Loving Heart. You do not always have to DO to have an affect on others, you can simply BE and create openings for change in those around you! 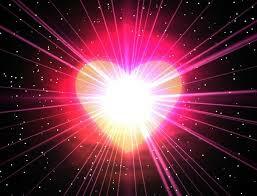 You can open hearts- without ever uttering a word!!!! ~ I had not done much healing work around Carson during his stay here either. 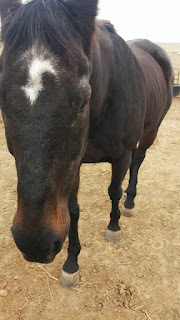 He learned everything he "performed" on me that day, by osmosis from being around my herd of other horses who are healers. Your horses are helping each other all the time! ANY horse who opens his heart and has an interest, can become a healer. ~ Never underestimate the power of your vibrationary offering to the planet, with you and your horses!!! We had not been consciously doing much energy, ritual, healing, or ceremony work on our property during the time Carson was with us. AND STILL he was showing us that due to the space we had created at the ranch, with our previous conscious intent, together with our herd, we were STILL OFFERING a TRANSFORMATIVE vibration to the planet. When that small voice of doubt creeps in that you are not good enough, not helping enough people, not creating enough change, TRUST that you are doing WAY more than you ever imagined to help the whole world SHIFT! ~ Of course, whenever we bring conscious intent to any of our offerings, it is strengthened, and so can we find ways to join together with our horse/herds and consciously send our combined hearts LOVE out to the Universe, even in quiet times when we have fewer clients or programming?! And so the horses invite you to own your magnificence as a Heart-Opener, on all levels. And to join with them as Heart-Openers in horse bodies, so that together the Light of your Hearts, may transform the dark into Light all over the world. 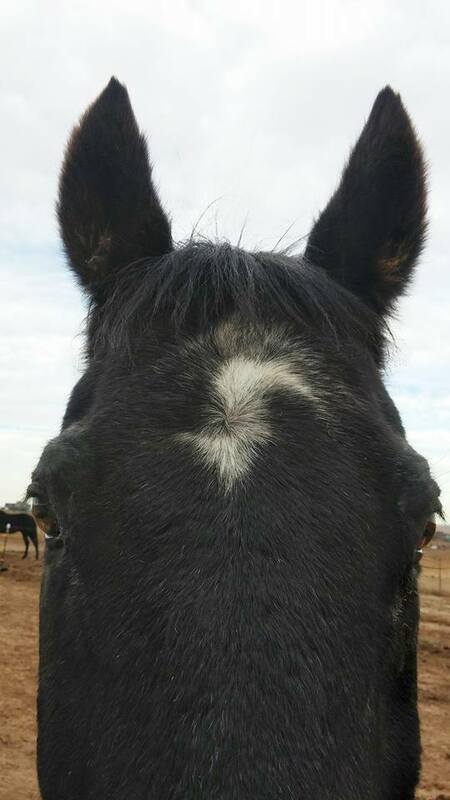 Please share: How have the horses opened your heart? How have they opened the hearts of others? 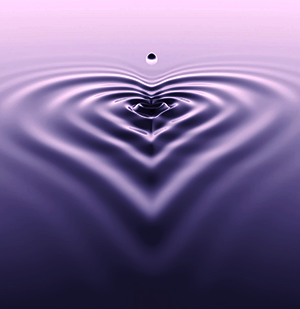 How has that created a ripple effect in the world? Please leave a comment and share! Thank you Dr Jenn! You have put an experience that is difficult to articulate, into words in a way that makes sense to all. I have 4 horses - all are open hearted spiritual communicators. My first horse opened my heart when I was shut down like Carson. We connected the instant we met - she a boss mare in the making at 2 1/2 years and me - very new to horses at middle age. Each horse that has come into my life has their own gifts - The dominant mare (micromanager) who communicates with words and actions more than images, requires people to speak clearly, don't hold back and speak from their heart. When a person holds back, she stomps her foot - multiple times and stares them right in the eye. Appaloosa - did you guess? As a result of the ripple effect, I've opened my place to teach classes and allow others to experience horses as they are when allowed to be themselves. The results of these experiences opens doors and changes lives in ways that makes possessions meaningless. The horses effect on me? I've rekindled a passion for healing as well.The horses and I help others find a spark within them that changes their life - and continues to change others. Horses are amazing just as they are. My wish is that people stop turning these amazing creatures into a dollar value, and leave the wild horses with their social structure and family life intact out on the range. We have so much to learn from them. Thank you Dr. Jenn and Carson! Beautiful and powerful. And I loved the kitty cat too!! Heart hugs to you!! 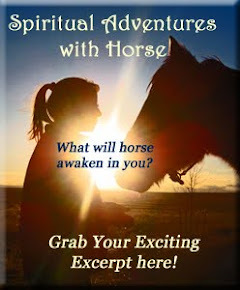 Many blessings on all the wisdom horse messages you are now sharing on facebook Karin! Thank for this wonderful message! It resonates a lot with my own experience of my own 2 furry heart opener <3.